We’re breaking all kinds of productivity records here at Trans Atlantis (and over at Uncivilized Books). For example blogging is up since last week by over 100%! This inspired us to draw this quick portrait of a young Alexey Grigoryevich Stakhanov, the patron saint of industrial productivity. I won’t recap the history of the man here (or any disputes about his records), suffice it to say that he was very productive (or so it was claimed), he was a genuine hero to many and he inspired the Stakhanovite movement. Was there ever an American version of a supremely productive worker, mythical or otherwise? The closest I can think is John Henry who outraced a steam hammer… but he died in his victory. And really, his story is a tragedy signifying the end of human prowess in the face ‘the machine’. 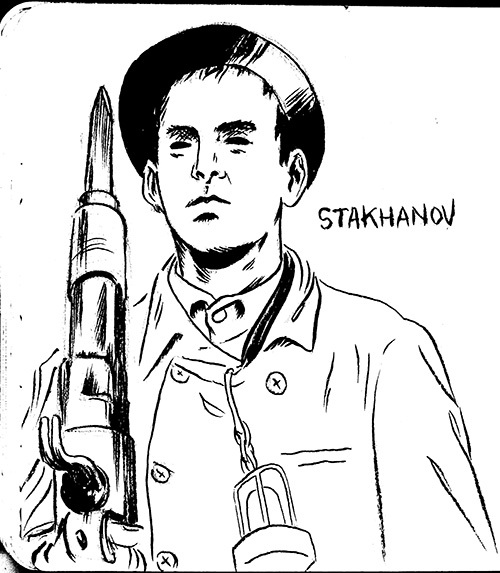 Stakhanov worked with machines & his comrades and achieved unheard of levels of productivity. But I can’t think of a single western worker hero. They are generally depicted as part of faceless masses (say in Metropolis) or bumbling fools (Chaplin’s Modern Times). Is there a hero for post-industrial office workers? I can’t think of one. Office workers – though often depicted with more personality than industrial workers – are mostly shown as petty & damaged bureaucrats (The Office) doing mostly nothing in the strict hierarchical pyramid-like corporate system. It seems the only genuine American heroes are ‘titans of industry’ and their rags to riches tales of relentless ambition. Is there anything heroic in doing your daily job in America? Or is that for suckers? Am I missing something obvious? This is also invites comparisons of industrial work with post-industrial work. Is social media todays coal mine?